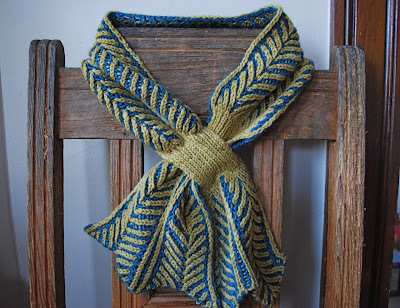 Lately I've been drawn to knitting projects that are short and sweet. I guess that correlates to the amount of knitting time I've had. That trend continues with my latest finished project. Haselnüsse. 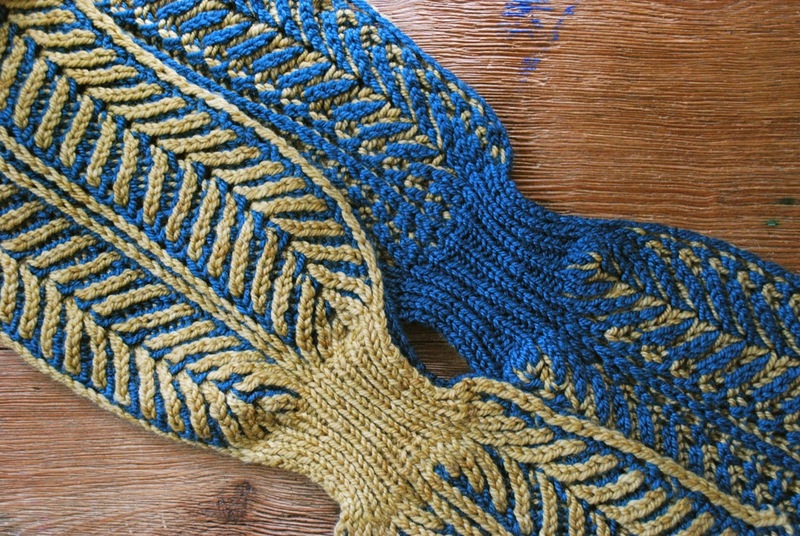 This little neck warmer knits up quickly and would make a great last-minute gift. The lacy scalloped edge and buttons give it a feminine look. 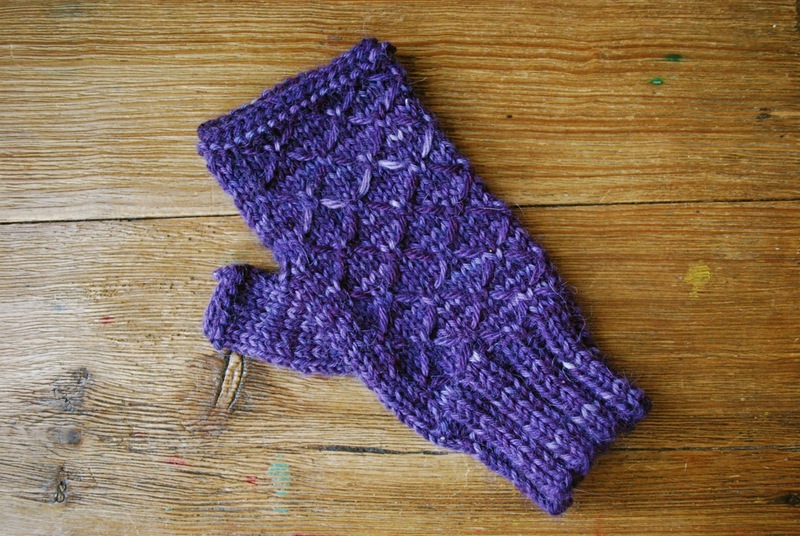 The pattern includes both written and charted instructions and is available in three sizes. The yarn is Dirty Water DyeWorks Edna, colorway Lupine. 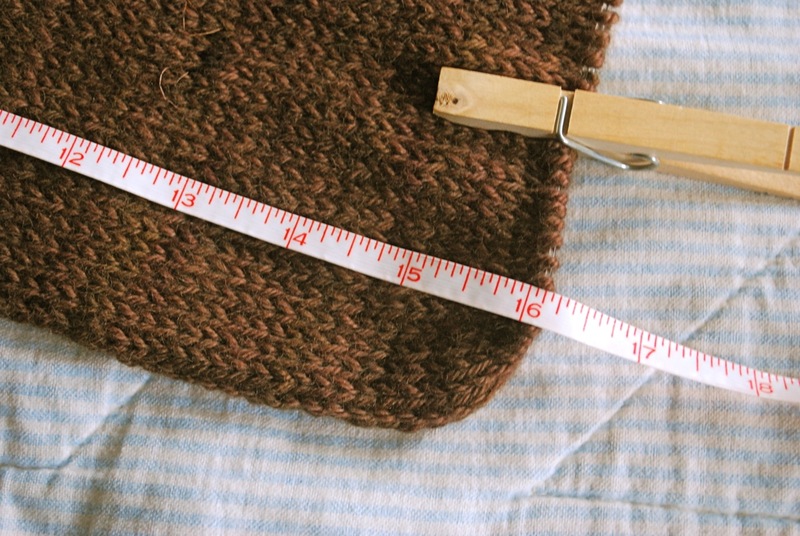 Believe it or not, this project takes less than 50 grams of yarn. This weekend Haselnüsse will be traveling with me to SPA in Freeport. 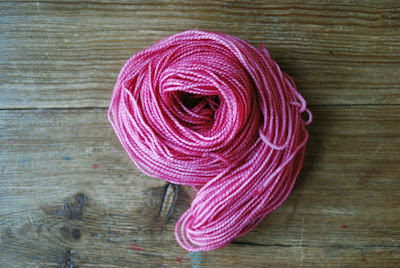 I'll have a selection of smaller Edna skeins available in a variety of colorways. For the first time in a while I don't have my next project waiting in the wings. Maybe it's time for socks or a shawl or . . . It's Monday morning, and I'm trying to orchestrate a quick turnaround. 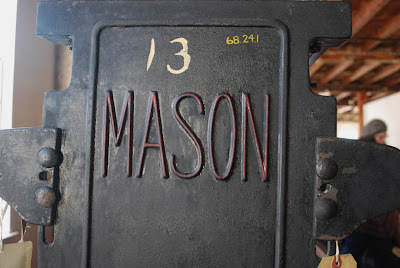 After spending the weekend at Slater Mill, I have just a couple days before I head up to Freeport and SPA Weekend. Fiber events seem to come in bunches. After this little flurry of activity, I won't be on the road again until April. Before I tackle my SPA master list, here's a quick recap of the weekend. Fiber events at Slater Mill are always a delight, and this past weekend was no exception. The mill has been restored into a museum and community space. No matter how many times I've been in the museum, I always seem to spot something new. 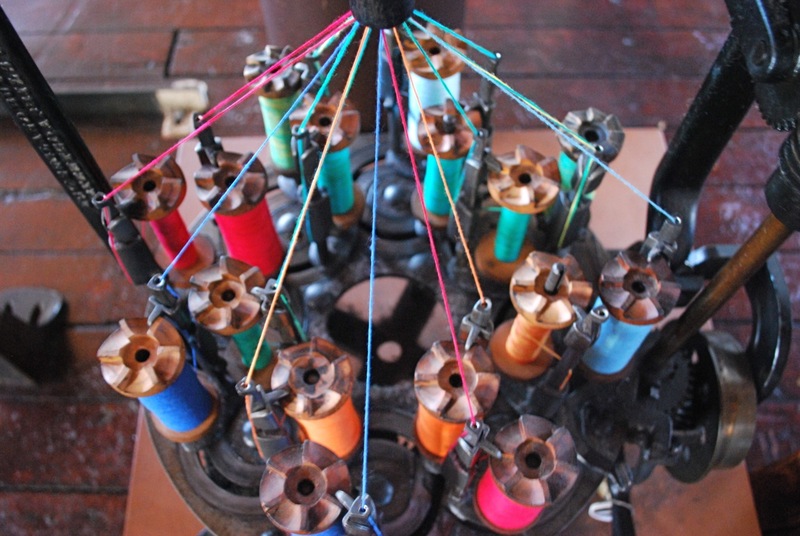 I'm fascinated with mills, textiles and the impact they had on the New England economy. 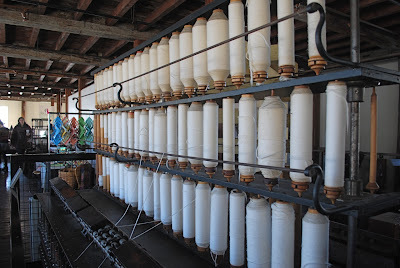 I know bits and pieces of the Slater Mill story from reading the various museum display notes. I've decided that one of these days I'll have to take a tour of the mill. Hearing the whole story will put all the pieces together. 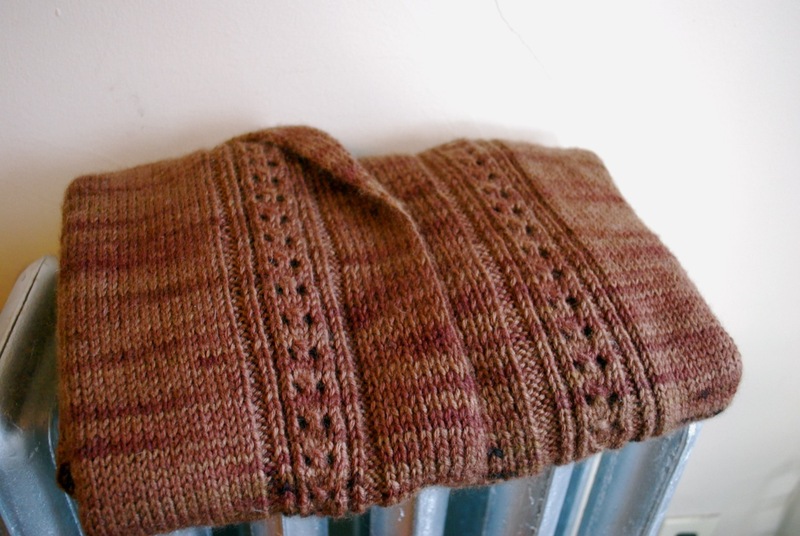 The class list for Knitting Weekend was very impressive - Icelandic knitting, Shetland lace, set in sleeves. 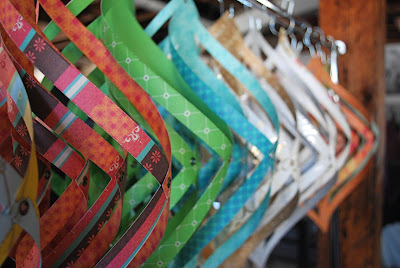 The vendor market was just as diverse - repurposed clothing, felted items, jewelry, colorful yarn and fiber. There was even qiviut. No, it didn't come home with me, but it's nice to know there's a local source. 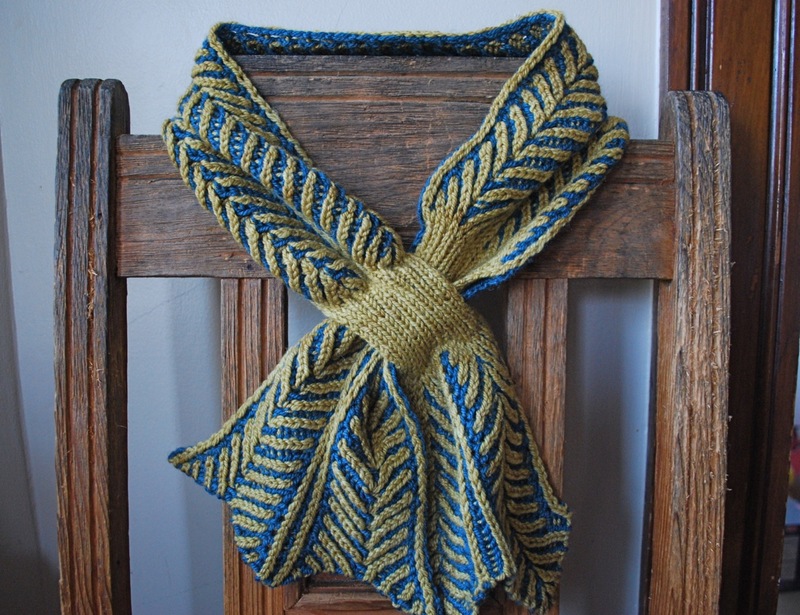 It was great fun to spend the weekend with the enthusiastic Rhode Island fiber community. And now I'm off to channel some of that energy as I get ready for my next road trip. One more booth sample, that is. This idea has been brewing for a while, and I finally acted on it. X-Mitts. You may remember that I knit this mitt in the fall out of a 100% Merino yarn. 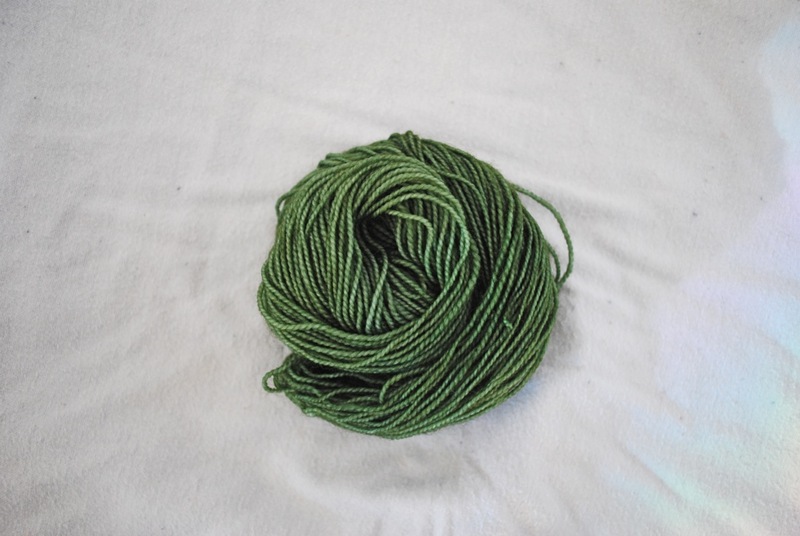 I had the idea of also offering it in another base that I feature at shows - an Alpaca / Merino / Silk blend. Earlier this week as I headed out to knit night, I grabbed all the necessary supplies. 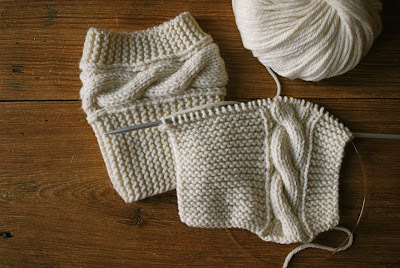 By the end of the evening the mitt was almost finished - all except the thumb. The next day I added the thumb, and it was ready for wear. 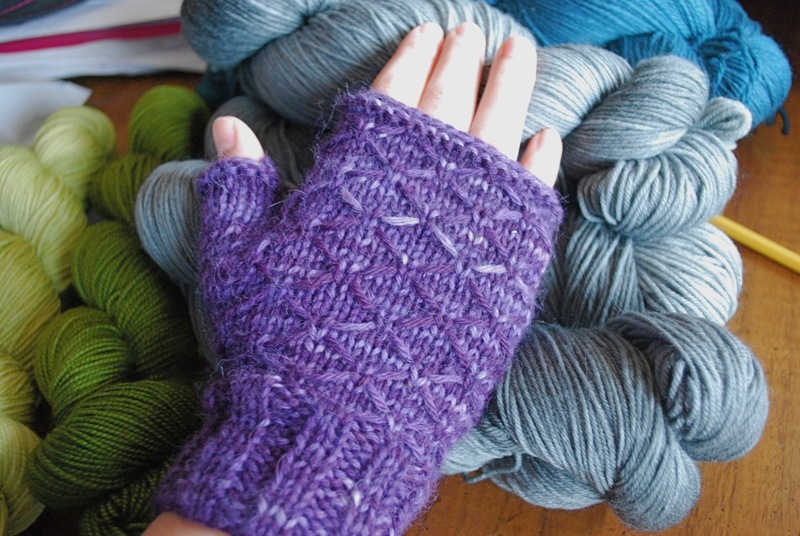 I must say I love mitts made with this blend - warm and cozy with a bit of luxury. This mitt won't have to wait long to make an appearance. Tomorrow it will travel with me down to Knitting Weekend at Slater Mill. 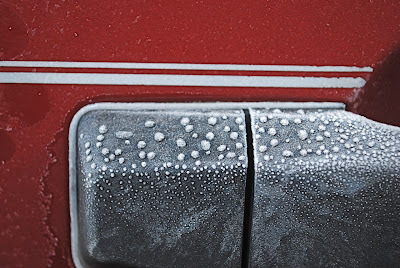 Mother Nature served up frigid temperatures this week. 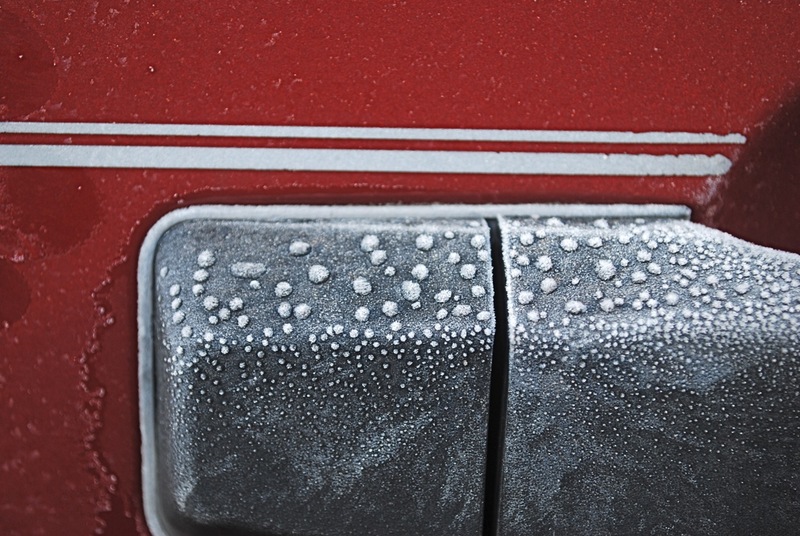 I'm invigorated by the cold, but I know for many it's challenging. My color inspiration this week reflects the thermometer. These days I find myself contemplating colorways . . . which ones should I retire or send on sabbatical, which new ones can I bring on board. Sometimes my decisions are based on inventory and sales records - what sold well and what didn't. Other times it's purely subjective - I'm bored with that color so it's out of here. New colorways usually involve a bit of research and plenty of experimenting. It's a fine line between the different color combinations. And what you see on paper doesn't always transfer to yarn. 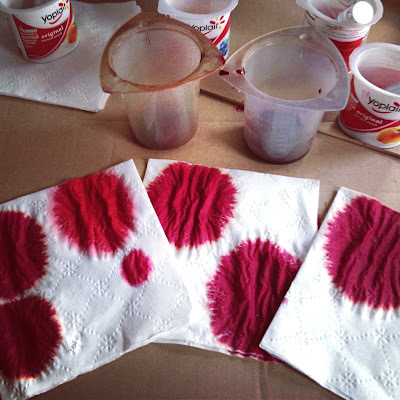 Often the written formulas are only a springboard for what actually ends up in the dye pot. Some of the best colorways happen by accident. Dyeing yarn samples is the next step. I was pleasantly surprised with this combination. I'm rather smitten with it, and I'm not usually a pink person. And this one shows potential. A new colorway may get thumbs up or thumbs down. Either way it's all fun. 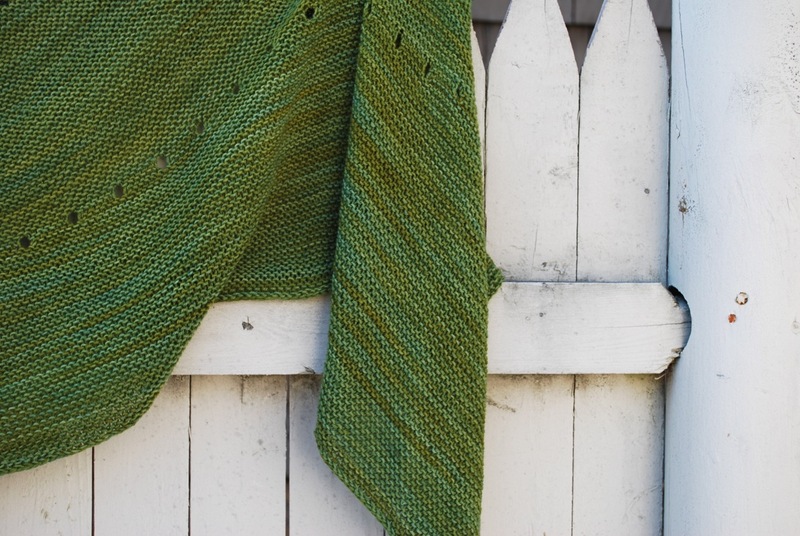 It can be a good thing to have several lingering knitting projects. It's like having an arsenal ready and waiting . 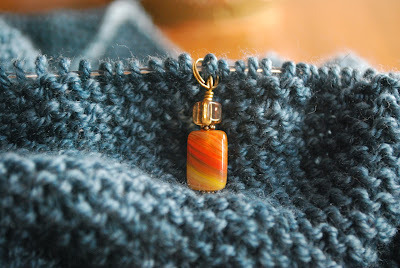 . . waiting for the momentum, the final nudge to finish them up and get them off the needles. I find that once I start attacking these projects, I usually knock off several at a time. It feels so satisfying to finish the first one that I don't think twice about working on the second and the third and . . . Before I know it, I have a small pile of several new handknits. The other day I added to my growing pile with Cassis. This longer sweater has lace panels on the fronts and the back - just enough detail to keep it interesting. The design calls for short sleeves, but you could knit them long if that's your preference. The yarn is Dirty Water DyeWorks Clara, coloway Bark. 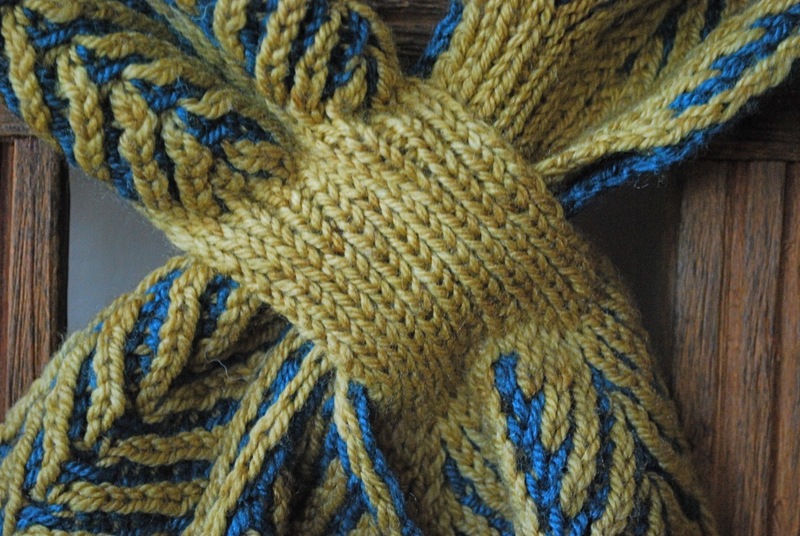 This 100% Blue Faced Leicester yarn makes a cozy fabric - perfect for sweaters. Sad to say I'm almost out of works in progress. That means a case of startitis can't be far behind. That's OK. I have a long list of projects to choose from. A while ago a friend offered to knit a booth sample. I'm always changing the booth samples, so I asked her what she was in the mood to knit. She said she was in a brioche mood. Lovely. Something new, interesting and inspiring. 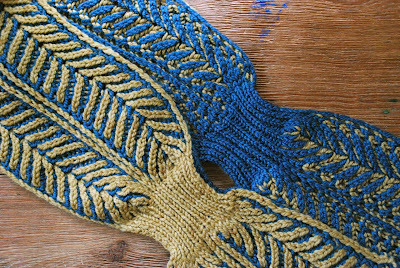 Brioche knitting creates a two-sided fabric and can be a fun way to play with color combinations. The fabric is reversible with opposite colors. Rodekool has a clever little option. 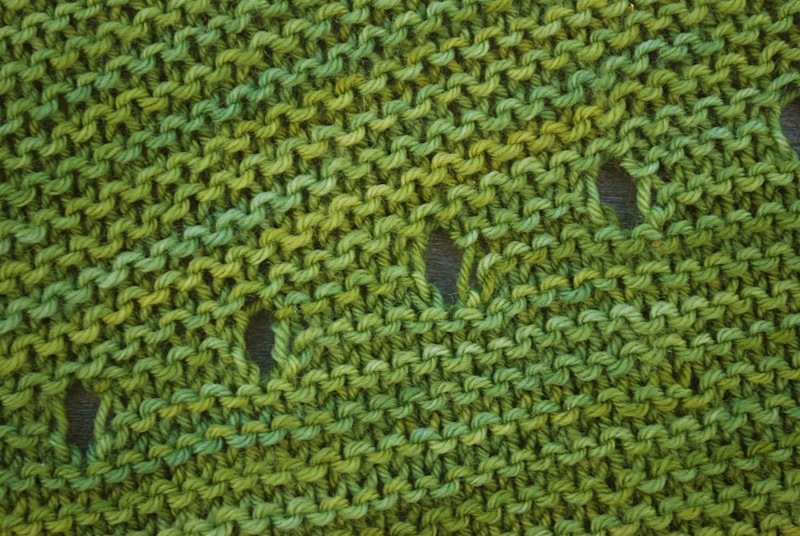 A built-in slit for tucking the end of the scarf. The yarn is Dirty Water DyeWorks Edna, colorways Dijon and Moon Shadow. I've been dyeing various colors and will have them available in scarf quantities at upcoming events - so many options for color combinations. This time of year I find myself craving vibrant colors. 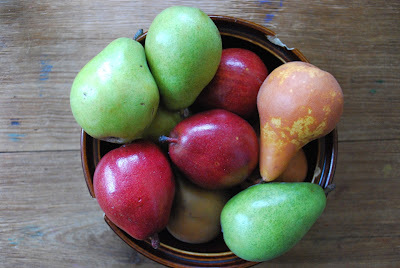 I didn't have to look further than my dining room table for this week's color inspiration. Red and green with a splash of yellow. There are times when forward progress is an elusive goal. I'm having a week full of obstacles - two steps forward, one step back. Instead of running in circles I've diverted my energy to something productive. The body of Cassis is off the needles, and there's a sleeve under construction. 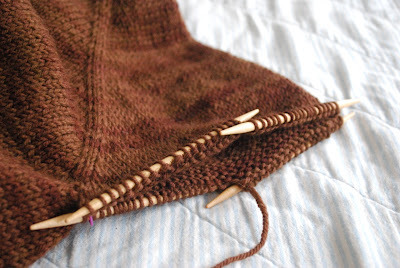 These sleeves are short and sweet, so I'm sure they'll be finished in no time - maybe even later today. 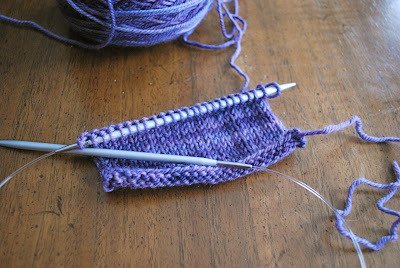 I have another little project in mind, and there's already a swatch in progress. After all I don't want to lose my momentum. I spent part of this past weekend at FiberCamp Boston. This attendee-led unconference is always interesting. The atmosphere is relaxed, and people are often sitting around, knitting, catching up since the last time they saw each other. I knew I was going to have plenty of knitting time and vowed to make the most of it. I have a couple of new projects in mind, and I was very tempted to cast on something fresh for the weekend. Instead I took a look at the projects already in progress. I picked out the most urgent one and brought myself up to speed on where I had left off. Sometimes I think that's the biggest hurdle to jump-starting a lingering project. 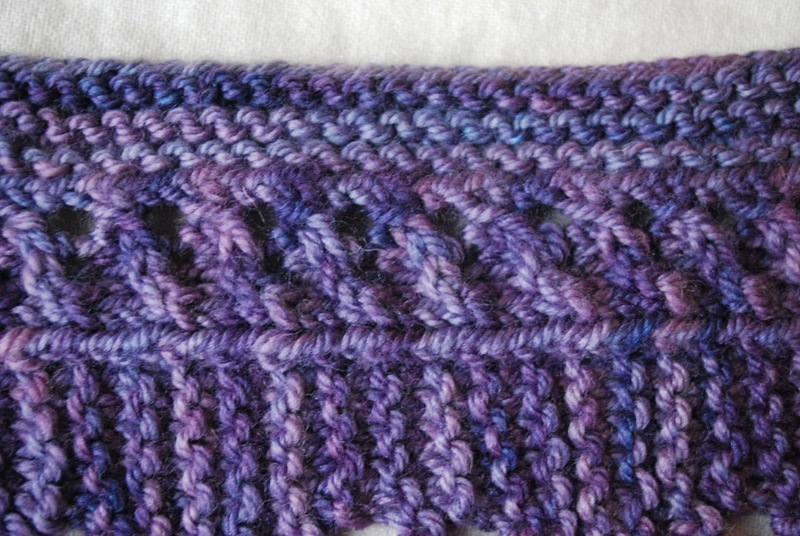 I chose Cassis for my weekend knitting. I started this as a booth sample in the fall. Other projects intervened, and I had to put it on the back burner. 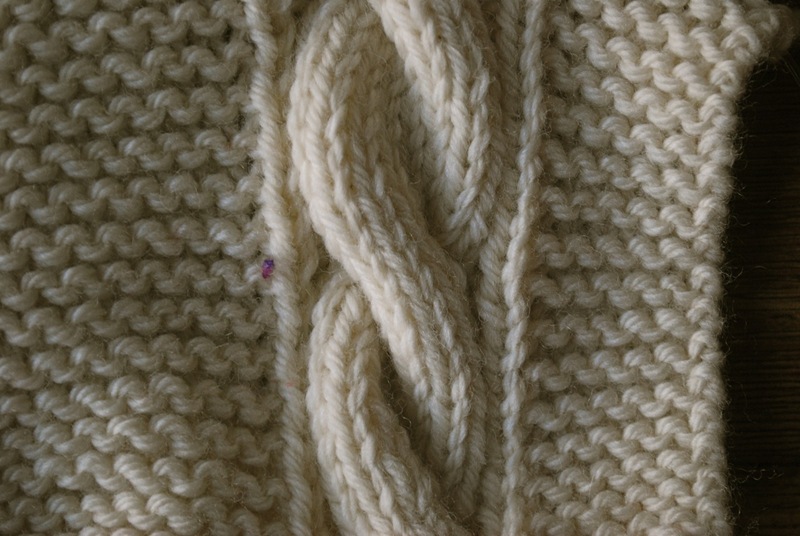 This is a top down sweater. The sleeves had been set aside, and I had been working on the body of the sweater down to the bottom edge. This is a long sweater, so the body below the sleeves goes on and on. After I reacquainted myself with the pattern, I was off and running. 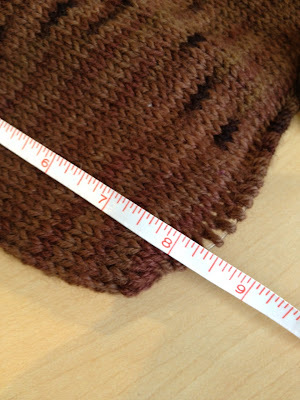 On Saturday morning this was the body measurement below the sleeves. This was the measurement after a weekend of work. 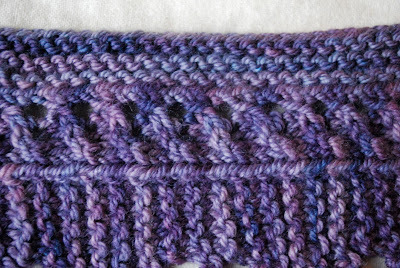 I need just a few more rows, and then it's on to the bottom ribbing. Since this is a booth sample, I'm knitting it to the recommended length. If it were for me, I wouldn't need to make it this long. It's a Monday morning, and this project is well on its way to completion. Not a bad way to start the week. The other day I needed a small, portable knitting project. The project didn't have to be completely mindless, but it had to be something that didn't require a lot of thought. A sock was the obvious choice, but then I remembered a little something my daughter had requested. Boot toppers - quick, easy, instant gratification. 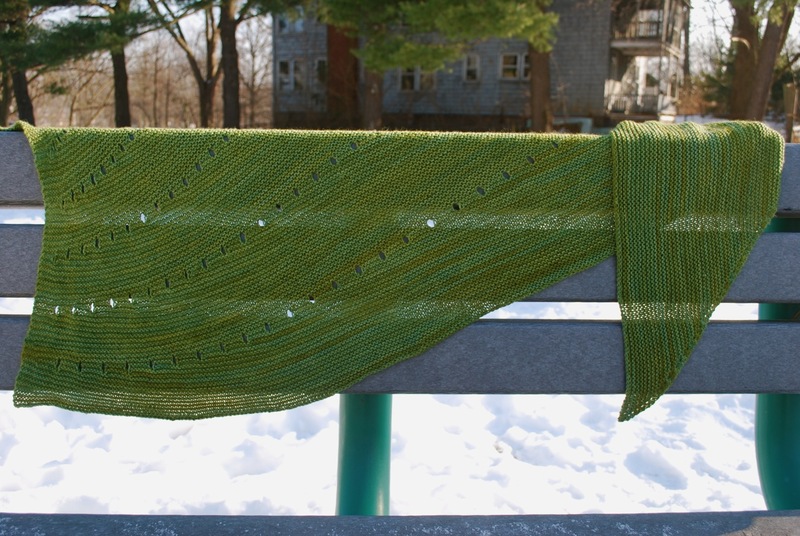 This project wouldn't have lasted for a full day of on-the-go knitting, but it was perfect for the amount of time I had. The pattern is Boho Style Boot Toppers. The yarn is Valley Yarns Amherst. This design includes a simple cable to keep things interesting. I may have to make another pair for good measure. My color inspiration this week comes from the world of snow and ice. 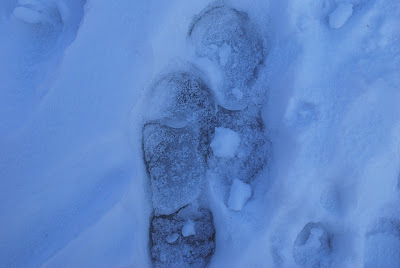 These footprints provide a unique blend of gray and blue. 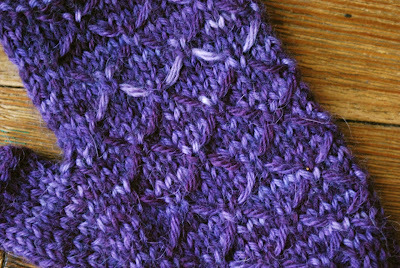 I've been working on Grayling, among other things. 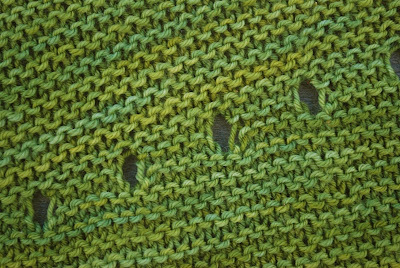 I've separated the sleeve stitches and set them aside. Now that the rows are 100 stitches shorter, they seem to be zipping right along. I have a plan to modify this pattern with a button. 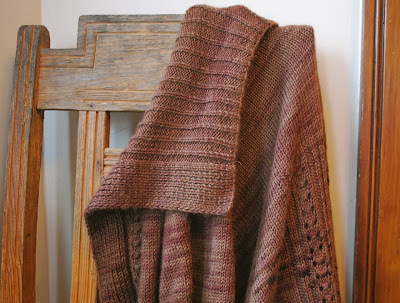 Grayling is an open cardigan with overlap, so it can be closed with a pin or other closure. I thought it would be handy to have a button. I've been thinking a lot about this button. Usually I make a sweater and pick out the buttons after it's finished. For some reason this time the unknown button is nagging me. So I went through my button box in search of the perfect match only to determine that I don't have the right button in stock. But the effort wasn't a complete waste. I was able to narrow down the size of the button, and that information will be helpful when I make the buttonhole in just a few rows. I'm resisting the urge to scrap my plans for the day and go on a button buying expedition. If I'm successful at the first stop, it would only take the morning. No, instead I have a long list of dyeing and winding on deck for today. I'll have to save the fun of a button search for another day. I'm sure the perfect button is out there . . . just waiting to be discovered. 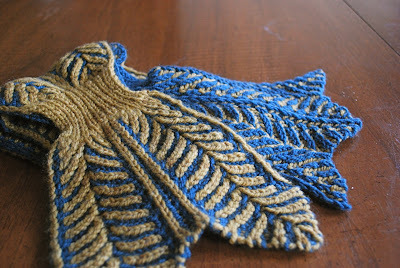 The other day I finished a lingering knitting project. This was my mindless project - the one I worked on when I needed to knit but couldn't give it my full attention. So I worked on it sporadically, and it lingered. Secret is an asymmetrical shawl. It's substantial yet surprisingly light and airy. The design is all garter stitch - comforting, dependable garter stitch. 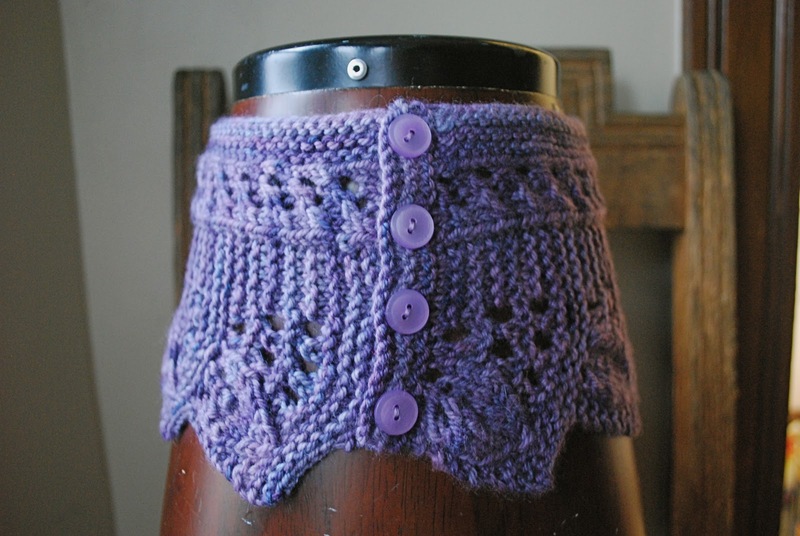 Short rows combined with yarn overs create the eyelets - very clever. The yarn is Dirty Water DyeWorks Lucia, colorway Pixie. 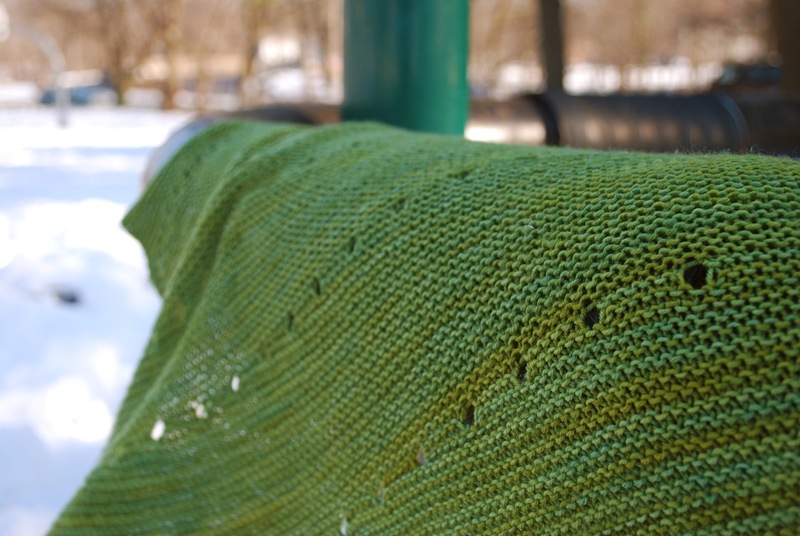 This Superwash Merino / Nylon blend is a workhorse yarn for socks, but it has elegant drape with this shawl. Now I'm on the prowl. 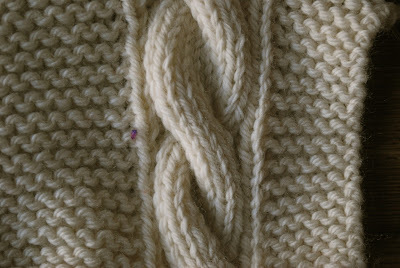 I need another mindless knitting project. While I'm plotting and planning to kick the dye pots into high gear, I've been savoring the last couple days of relative peace and quiet. Now that my office is organized - or as organized as it gets - I decided to tackle my knitting tools. I have bins, boxes and bags full of all sorts of knitting-related gadgets. Often I can't find what I need when I need it, so clearly I need a better system. For starters my knitting needles are a jumble. 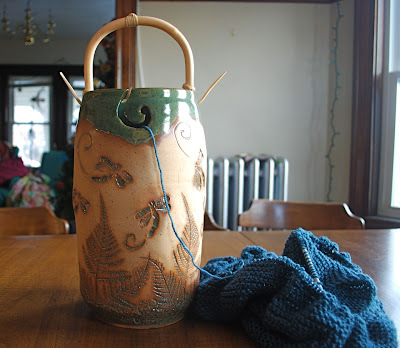 I still haven't come up with a system for keeping them neat and tidy, but after seeing someone at knit night roll out her needles in one little bundle I'm inspired to come up with something. Knitting needle storage is a project in progress, and the solution just might involve the sewing machine. The upside to all this sifting and sorting is that I uncovered a couple of tools I had forgotten I owned. It's encouraging to get a small bonus for all my efforts. 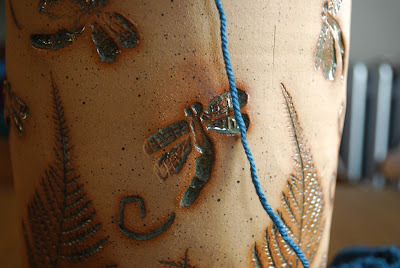 For example, I had tucked away this knitting bowl from Sue Henshaw Pottery. I received this last year as a gift but put it away - probably because I didn't want it to break. I have sad tales of many special coffee mugs that have come and gone. The back side has a little pouch for small things - scissors, darning needles, tape measure. I had to put this lovely bowl to use. After all, it's too pretty to leave in a closet. 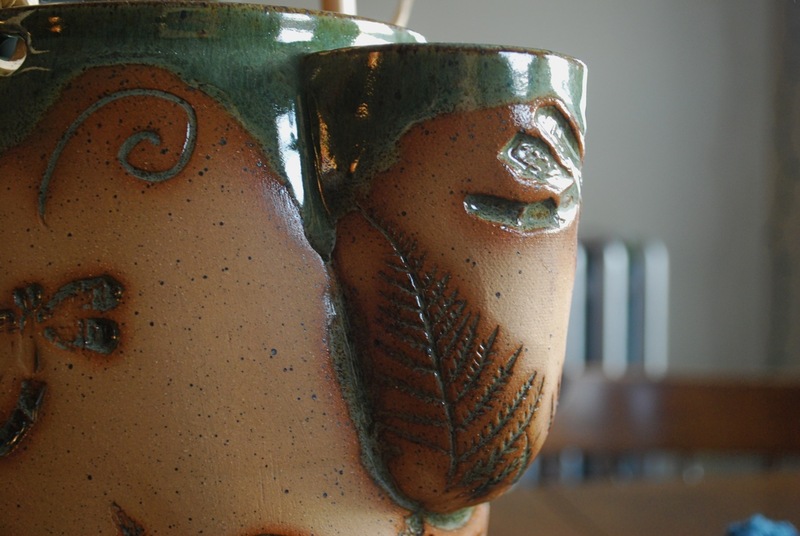 I'm sending out positive energy that this bowl won't suffer the same fate as my special coffee mugs. The other exciting find was these fancy stitch markers. I don't know where they came from - maybe a Yankee swap. 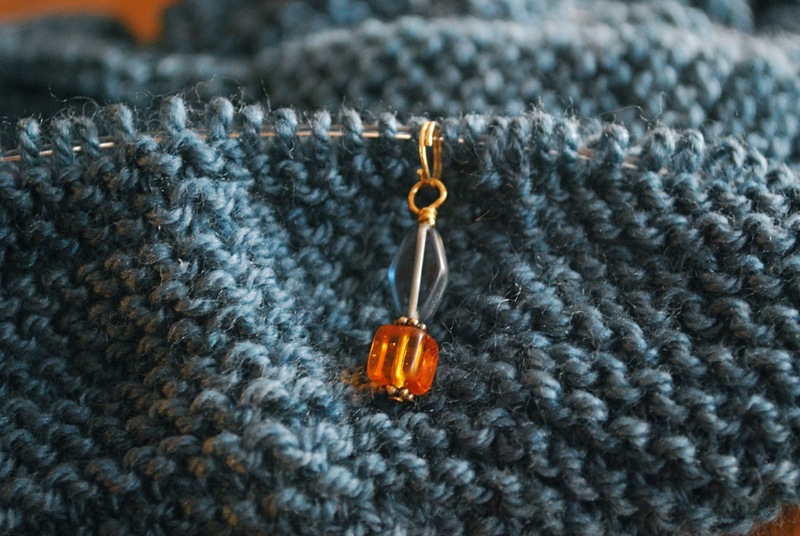 Normally I use plain old plastic stitch markers, but these stitch markers couldn't have surfaced at a better time. 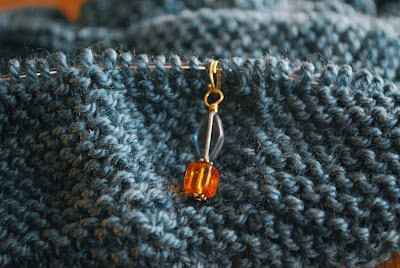 I seem to have lost all of my smaller plastic ring stitch markers. Sometimes I think they just evaporate. They will probably reappear one day, but in the meantime I'll enjoy these. 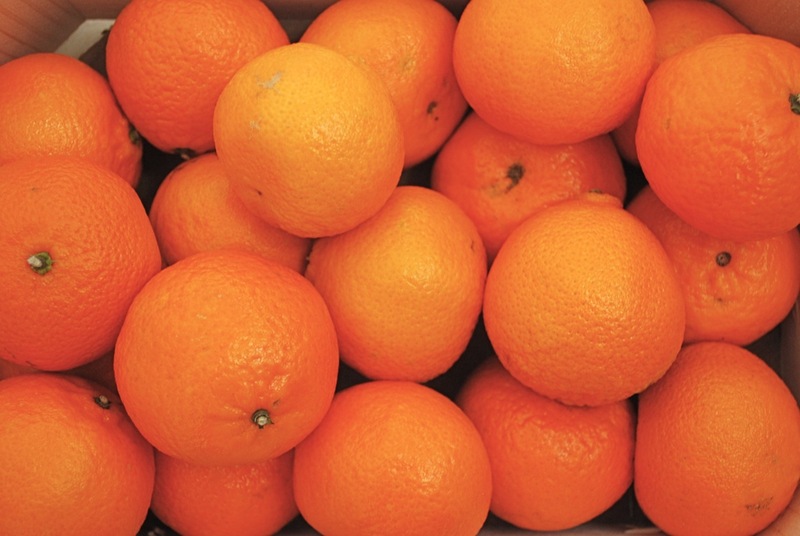 In contrast to the dark and gray of winter my color inspiration this week is bright and bold. A reminder of the sun. One of my goals for going into the new year was to have my calendar organized. I keep a couple of electronic calendars - one at my desk, one on-the-go. Over the past couple months there have been syncing issues - what was on one calendar didn't necessarily appear on the other calendar. To confuse matters even more, sometimes there were in sync. I was always second-guessing my schedule, and it was driving me batty. After a couple of missed appointments, I realized I had to take control of the situation and come up with a better system. So by the end of the year I upgraded my electronic gadgets - an organized schedule was within my grasp. In theory I had to enter information on one electronic calendar, and it would magically appear on the other electronic calendar. As with so many situations theory and reality are two different things. I had a hunch the process was going to be time-consuming, and it was. Over the weekend I sat down and entered my schedule month by month for all of 2013, and I'm so glad I did. The old calendar I was working from had incomplete and inaccurate information. For example, I had the dates for a couple fall events all turned around. That was a double-booking just waiting to happen. While I was in calendar mode, I updated the Events page on the website. There are still some pending events, and these will be added to the website as soon as they're confirmed. You can also spot the most immediate events in the sidebar to the right. Now that all my calendars are current, I can confirm that my schedule is full. It's an exciting way to head into the new year. And now I'm off to finish prep for a class I'm teaching tonight - a knitting sampler. I have one hour with new knitting recruits - just enough time to give them a taste of knitting and all the wonderful possibilities. The idea is that after one hour, they'll be hungry for more. I feel like a knitting missionary.